Annotation: This familiar nursery tale features a warmly appealing bear family and a naughty, gap-toothed Goldilocks. 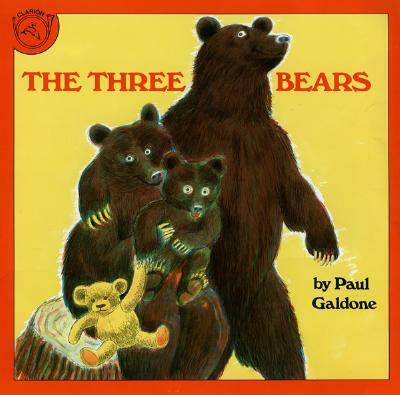 This familiar nursery tale features a warmly appealing bear family and a naughty, gap-toothed Goldilocks. Paul Galdone was born in Budapest, Hungary in 1914 and emigrated to the United States in 1928. After finishing his studies at the Art Student League and the New York School of Industrial Design, Mr. Galdone worked in the art department of a major publishing house. There he was introduced to the process of bookmaking, an activity that was soon to become his lifelong career. Before his death in 1986, Mr. Galdone illustrated almost three hundred books, many of which he himself wrote or retold. He is fondly remembered for his contemporary style, bright earthy humor, and action-filled illustrations, which will continue to delight for generations to come. These four books (more to come) appear in a uniform paper-over-board edition. Galdone was a refreshingly modest illustrator: his retellings are straightforward and his unassumingly loose-lined, color-separated pictures provide just enough embellishment, as when the lazy cat in The Little Red Hen lolls on the couch, dreaming of sardines. Plenty of white space gives the stories all the room they need. [Review covers these titles: The Little Red Hen, The Three Bears, Three Little Kittens, and The Three Little Pigs.] Copyright 2011 Horn Book Guide Reviews.